Here are some of my photographs, acquired with a Tele-Vue 4" refractor and a Canon EOS 60D. Click the image thumbnails to show an image in the large window below (or use keyboard arrow keys). The 2017 eclipse I describe here was only my second solar eclipse during a lifetime interest in astronomy. I saw my first in Hawaii in 1991, during my solo circumnavigation, an experience I describe in this chapter of my sailing book (search for the word "eclipse" in the linked chapter). Experts suggest that people not try to take pictures during a solar eclipse, because the distractions created by the telescope and camera often detract from an otherwise dramatic natural experience. I decided to take pictures anyway and I think it was worth it, because the pictures, imperfect as they are, let me relive the original experience. While planning my eclipse outing, in retrospect I have to say that I just didn't get it. I didn't appreciate that many more people planned eclipse outings than had ever happened before, and post-eclipse estimates say that 18 million people saw totality (6% of the population), either by going outside if they happened to live within a 70-mile-wide coast-to-coast strip of real estate, or by traveling to a location within that strip. This meant that, no matter which location I chose, chances are others would be considering the same destination. I live in Washington State, in a location where if I stayed home I would see the moon cover 93% of the sun. Those who understand the physics of solar eclipses know that 93% coverage cannot remotely compare to 100%, in fact unless you were warned in advance you might not notice that the sun was providing only 7% of its normal output. So totality is a requirement. 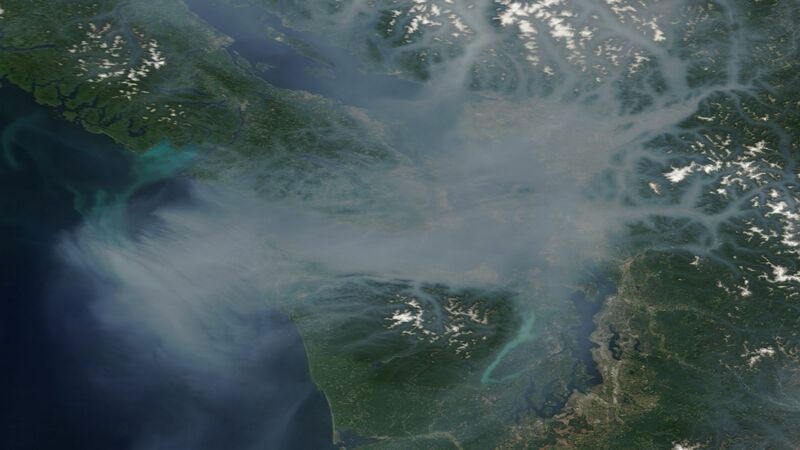 I had just returned from my annual Alaska boat cruise and while in British Columbia I saw some extreme smoke conditions brought on by wildfires, such that in midafternoon the sun was reduced to a dim red disc and the sky was a gray-brown color. So one of my search criteria was a location away from the West Coast, to avoid wildfire smoke. I also rejected the idea of visiting one of the Oregon cities that were hosting eclipse events (examples Salem and Madras), but that were likely to be very crowded as well as being too close to wildfires. I considered Unity Reservoir (44.5° N, 118.2° W), a remote location away from large cities and towns and on the path of totality, but investigation revealed that it had already been "discovered" and was likely to be packed. Around this time it began to dawn on me that this eclipse was attracting a lot of attention from curious people, people possessing leisure time and cars. My readers may know what is said about best-laid plans ("The best laid schemes o' mice an' men / Gang aft a-gley." — Robert Burns). I allowed myself plenty of time to arrive in advance of the eclipse — two days. When I arrived I was the only person at Lime, Oregon — I had the place to myself. 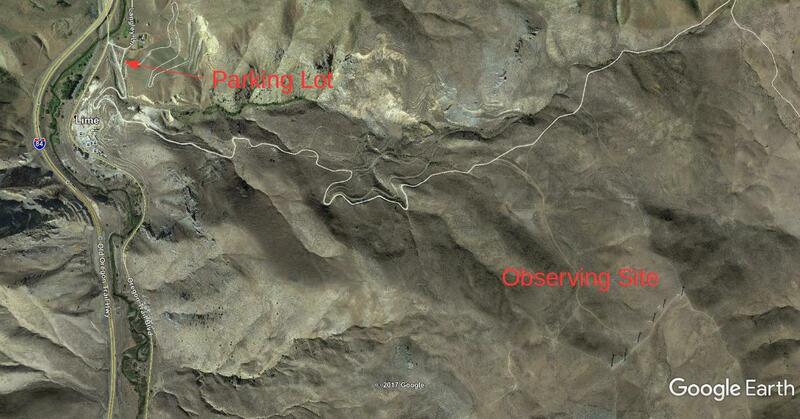 I drove my RV up toward the observing site shown in the graphic above, but before I could get settled in a policeman made me retreat down to the parking lot by the highway — apparently the authorities were concerned that people would occupy the hilltop and start a fire in the dry grass, or get sliced up by the many power windmills located nearby, or something like that. So I had to set up in the parking lot by the road. On eclipse day minus 2 I didn't mind — I was the only person there, so where I set up didn't matter. It was on Eclipse Day minus 1 that it came to me how much excitement this event was creating, and how even this remote site was fair game. But because of last-minute arrivals, Eclipse Day itself exceeded anything I could have imagined. My observing setup, a Tele-Vue 4" refractor (center). My RV is at the right. During a solar eclipse, the time from first contact (when the moon begins to cover the sun) to totality is about an hour. During most of that hour people's eyes adjust to the changing light levels in such a way that they can scarcely tell that light levels are declining — until the last few seconds, when it becomes dramatically obvious that the sun is about to be completely blocked — wham! Because of the brightness of the corona (the sun's outer atmosphere) and because of the amount of light entering the moon's narrow shadow from all sides, the light level during totality is more like deep twilight than night-time dark. Planets and brighter stars become visible. During totality the planet Venus shone brightly, nearly straight up and to the West of the sun's corona. I remember seeing Venus and thinking, "That must be Jupiter — it can't be Venus because Venus is never visible that high in the sky ... Oops, never mind." The air temperature really does decline significantly during an eclipse, but this change is more noticeable in a location exposed to the sky than it would be in a shaded area. For this eclipse I packed my Tele-Vue 4" refractor, which, apart from being relatively small and easy to pack, is in some ways ideal for a solar eclipse, because in poor seeing conditions small refractors tend to produce better results than larger telescopes. As things turned out, because of the relatively low altitude and high environmental temperatures, I couldn't have taken advantage of more aperture, in fact a larger aperture would likely have degraded my results. I was glad to get some photographs, but all sorts of things happened that I didn't anticipate to reduce the quality of the results. In retrospect I realize I had no chance to keep my telescope properly focused — between dawn and eclipse time, as temperatures increased, my scope sat out in the sun, warming up, expanding and needing periodic focus adjustments. Then, during the hour between first contact and totality, the temperature dropped, which required more attention to focus. Then as totality began I pulled the solar filter off my telescope, a change that I now realize may have required an additional small focus adjustment. All these factors, plus atmospheric turbulence, prevented tack-sharp focus in the set of solar images shown above. One more thing. As totality began, as the earth was abruptly plunged into darkness, I heard several thousand human voices raised at once, saying something that might be translated as "Whoa! ", echoing off the surrounding hills. I thought how nice that was — at a divisive time in our history, we could all have the same feeling at the same time, if only for two minutes. 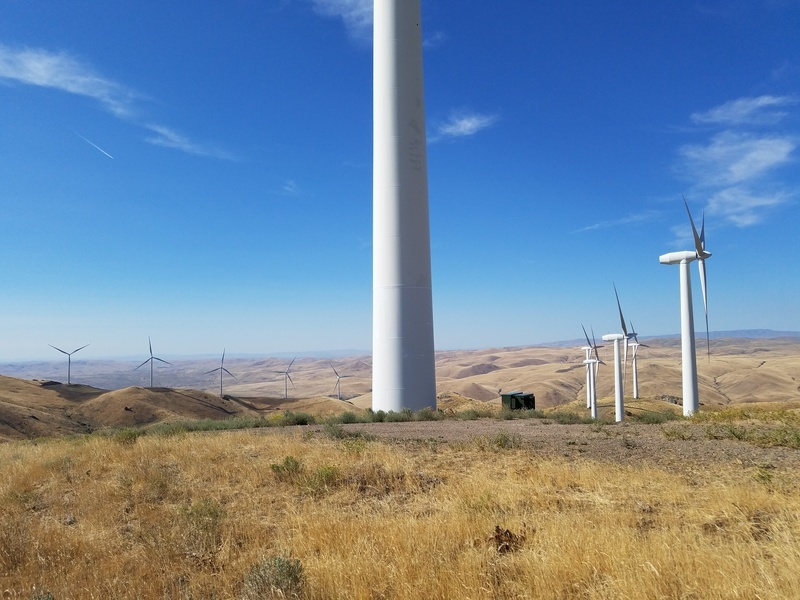 Apart from its special eclipse significance, Lime, Oregon turned out the be a rather nice place for a walk in the country. At the hilltop observation site that I didn't get to occupy, one can see the Snake River and Idaho. The irony is that Lime's transient significance relied on a random solar eclipse path that probably won't repeat for thousands of years. But as things turned out Lime was an optimal location for the eclipse. Many other Oregon locations experienced obscuring wildfire smoke, and in one case an eclipse viewing area had to be evacuated because of an approaching fire. This was a terrific field expedition — I doubled my personal eclipse quota, took some reasonably good pictures, and saw some pretty Oregon land. This section is a bit technical — I explain how to compute the relationship between obscuration and light level during a solar eclipse. 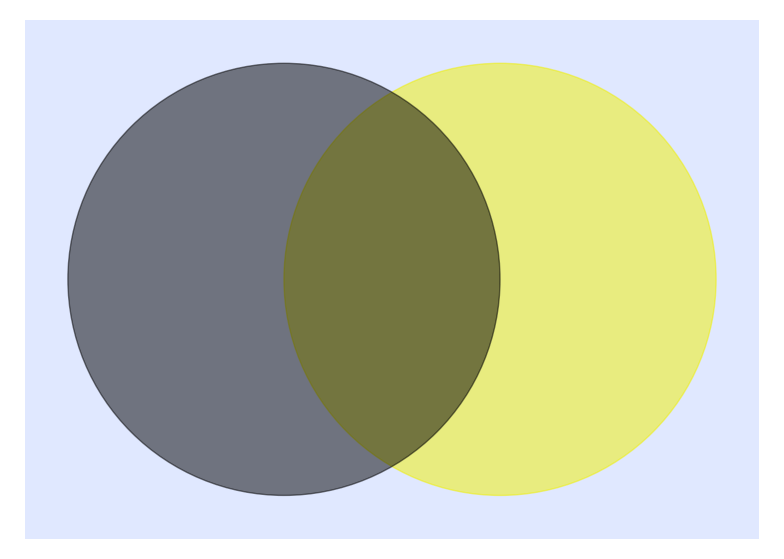 For simplicity in this model I assume the moon and sun have the same apparent diameter. b = Relative solar brightness. s = Full solar brightness. a = Area obscured by the moon. 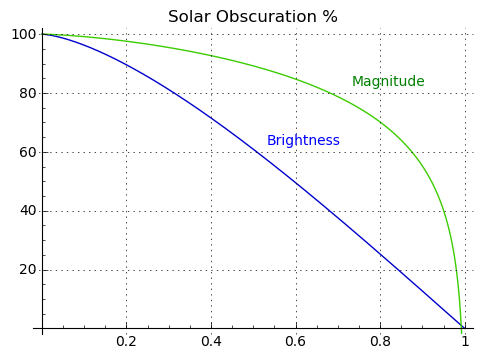 From a technical standpoint, the blue curve represents relative brightness in consistent units, but because human visual response is logarithmic, the green stellar magnitude curve more closely represents what a human observer would experience, and it reveals why the last few seconds before totality are so dramatic.